A consumer reported that there was no need to break in these shoes; for her, it was comfortable from the start. There were runners who liked that the platform was able to support the arch during their runs. The mid-sole unit of the Skechers GOtrail Ultra 4 felt plush and responsive, according to a number of testers. Many shoe enthusiasts appreciated the price of this shoe, stating that it was relatively cheaper than other max cushioned shoes. Some runners welcomed the apparently flexible forefoot section of the platform. Several purchasers noted that the toe box of the GOtrail Ultra 4 was roomy and that it accommodated natural toe-splay. The outsole’s grip capability gained positive remarks. The toe box started to get a bit cramped after an hour or so of running, a tester reported. The mid-sole felt a bit too firm for a runner; he didn’t feel a well-cushioned ride. According to a purchaser, the heel cup felt loose and sloppy, and his feet kept exiting the shoe unintentionally. A few testers stated that the GOtrail Ultra 4 was noticeably heavier than its predecessor. The general feedback for the Skechers GOtrail Ultra 4 was positive. Many runners felt that it was comfortable and agreeable as a max cushioned shoe. They lauded its relatively plush mid-sole, its responsive upper, and its efficient outsole. But there were those who felt that it was a step back from the GOtrail Ultra 3, particularly when it came to the weight and the too-firm mid-sole. Skechers GoTrail Ultra 4: Too bulky or a comfortable ride? The Skechers Gotrail Ultra 4 is a neutral trail running shoe with maximal cushioning. It has a thickly cushioned midsole with a 36mm heel and a 32mm front, giving it only a 4 mm drop. That is quite a lot of stack height and with a weight of 312g it isn’t a super light shoe, but for the amount of shoe that you are actually wearing it isn’t half bad. The sole has a rocker shape that helps you to toe off and Skechers uses the M-strike technology to promote a midfoot strike. Skechers has been working on their performance line for the last 5 years and I have owned almost all of their ultra series shoes. Skechers used to have just one ultra shoe in the beginning, but later on this was split into a road version and a trail version. I’ve tried both, but didn’t like the road version and switched to the trail shoe instead, since I did really like the predecessors of this shoe. I’m not a real trail runner, I only run easy trails during training runs and I don’t run trail races, but I have used these during my road marathons. Yes, I basically use them as road/trail shoes. I actually own three pairs of this shoe. On the Gotrail Ultra 4, there are no more stitches or overlays on the upper. The upper is made from a synthetic mesh which is glued together. Only the part around the laces has some stitching. This creates an almost seamless interior. On one of the pairs, a small part of the glued section came undone, but not in such a way that I could no longer use the shoe and this section also didn’t get any bigger over time. The other two pairs are just fine, so it doesn’t seem to be a very common issue. The mesh isn’t as flexible as it used to be and is actually a bit sturdier and thicker than on the Gorun Ultra 1 and 2, but the toe box is roomy and gives your toes enough space to move and splay while running. The tongue isn’t padded, although it isn’t uncomfortable, I don’t know why it isn’t padded. Is that supposed to be a trail shoe thing I just don’t know about? Why wouldn’t you need a padded tongue while running trails? The back has a quick-fit loop attached to it. This helps you get into the shoe but doesn’t bother you while running. The collar of the shoe is more durable than on the Ultra 1 and 2. 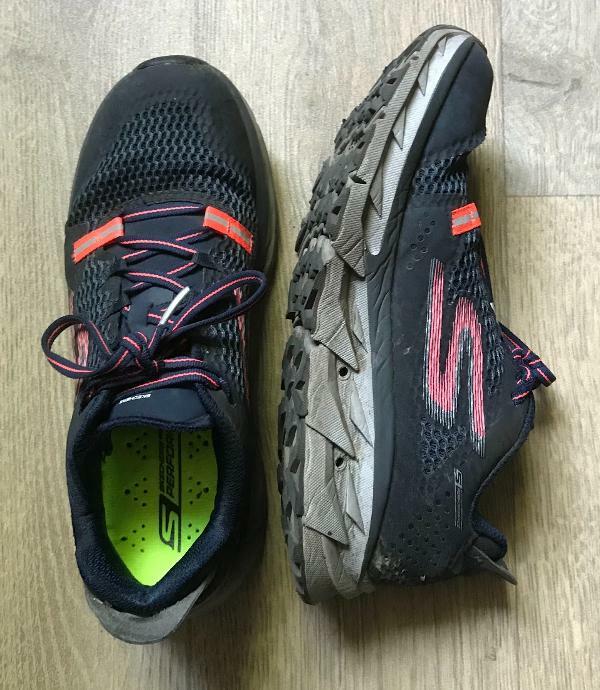 In the previous models, the fabric of the collar eventually ripped and I had to tape it in order for me to keep using the shoe, but I haven’t had that issue with the Skechers GoTrail Ultra 4, the fabric is still in one piece after hundreds of miles in these shoes. The midsole of the Skechers GoTrail Ultra 4 has a unique water drainage system. I was a bit skeptical of this in the beginning (how much can a few holes in the midsole of your shoe actually do? ), but it does work rather well. I was surprised at how quickly the shoes drained the water and dried up after running through a big puddle of water during one of my marathons. That’s probably because the drainage holes are on the side of the midsole, instead of on the bottom of the shoe. This prevents them from getting clogged up by dirt and the downward force of the foot while running will help get rid of the water. I found the midsole much more comfortable than the ones of its predecessors. That might be due to the 5GEN midsole material that Skechers used in the GoTrail Ultra 4. It isn’t a super responsive shoe, but the energy return certainly isn’t bad. The rubber outsole of the GoTrail Ultra 4 seems to be unchanged from that of the GoTrail Ultra 3. The outsole has deep lugs for traction and even deeper flex grooves. The durability of the outsole used to be a real issue for Skechers, but something that they’ve now seemed to have tackled with there new rubber outsole. It does provide enough grip on different terrains. It adapts to easy trail as well as running on the road. The lugs are not that noticeable while running, so it didn’t bother me while running on the road, but it does give you enough grip on a wet surface. Since the Skechers GoTrail Ultra 3 ran rather small, I decided to order half a size up from my usual size just to be sure. I did not regret that decision. Out of the different Ultra models that Skechers has produced over the years, the GoTrail Ultra 4 is definitely my favorite. It’s a bit bulky, but not too much and it’s very comfortable. It has a roomy toe box and an almost seamless upper. And they have fixed the durability issues of the previous models, the rubber outsole clearly last longer and the durability of the upper has also improved. If you’re looking for a shoe with plenty of cushioning that and underfoot protection that is rugged enough to pound out tons of trail miles without sacrificing much in the way of responsiveness, this shoe may be for you. The Skechers GOtrail Ultra 4 is a maximal cushion tail running shoe that still feels fairly light and fast. Very decent price and superb traction makes this a steal for max-cushion trail offering. The Skechers GOtrail Ultra 4 is a trail running shoe for those who have neutral pronation. It features a set of high-quality components that work together in order to provide an agreeable performance for the runner. In terms of the façade, the biggest change would be the lack of stitched-on overlays; this shoe makes use of hotmelt overlays to reduce bulk and encourage more flexibility. Synthetic mesh is used in the upper unit of this shoe. The nearly seamless construction staves off skin irritation. There’s a bit of stitching involved near the shoelaces to reinforce that section. The portal in the heel section that makes it easier to wear and remove the shoe is now an integrated unit that looks and feels more robust than a regular stitched-on loop of fabric. The 5GEN cushioning is used for the mid-sole unit of the Skechers GOtrail Ultra 4. This full-length foam is featured generously here because it’s a max cushioned shoe. But its purpose is to be responsive and to receive impact shock with ease. The mid-foot strike zone essentially encourages the runner to have a more efficient running output by striking with the mid-foot. The outsole of the Skechers GOtrail Ultra 4 is designed to handle various types of terrain. Aggressive gripping lugs make sure to hold onto the surfaces like clamps. Flex grooves in the forefoot section allow the platform to move in accordance with the motion of the wearer’s foot, thus heightening freedom of movement. The Skechers GOtrail Ultra 4 is half-a-size smaller than the usual, so it’s recommended for runners to choose half-a-size up in order to attain a more relaxed fit. The available width for both the men and women’s versions is medium, so it is able to accommodate those who have medium sized feet. The semi-curved shape of this shoe mimics the natural curve of the human foot. The Multi-Surface Traction System is used for the outsole unit of the Skechers GOtrail Ultra 4. It basically involves a rubber compound that’s able to stick onto the ground with ease. Gripping lugs heighten traction by acting as clamps that cling onto rocks and other trail surfaces. Flex grooves in the forefoot make the platform more flexible. They make sure that the foot is able to move more naturally, especially during the toe-off phase where the foot bends the most. The 5GEN cushioning system is used generously in the Skechers GOtrail Ultra 4. This responsive foam material cushions the foot well and protects it from the impact shock generated by striking the foot on the ground. This material is also used in some popular Skechers running shoes. M-Strike is a mid-sole construction that encourages the runner to strike with the mid-foot, thus effecting a faster and more efficient transition through the gait cycle. There are drainage holes in the mid-sole, just in case water comes into the shoe. It funnels the water from the interior foot-chamber and out through small portals in the medial and lateral sides. The OrthoLite Sock Liner adds a bit more cushioning to the underside of the foot. Furthermore, it also has anti-microbial and anti-moisture capabilities, which keeps the foot clean and healthy throughout the running experience. Synthetic mesh is the main fabric used for the upper unit of the Skechers GOtrail Ultra 4. It offers a secure yet breathable coverage to the runner. The seamless construction prevents skin irritation. The Dual Hotmelt Overlay system provides structural integrity to the upper unit of this shoe. It also doesn’t make the façade look bulky. But its preliminary purpose is to provide a snug and secure fit by working with the lacing system. Support straps connect the medial and lateral sections of the upper with the shoelaces. They assist in customizing the overall fit by adapting to the tightness or looseness of the lacing system. A molded heel counter secures the heel and keeps the foot in place. It also prevents accidental shoe removals. The Quick Fit Portal is a tab in the heel section that makes it easier for runners to put on and remove the shoe.